The acclaimed writer fired a series of salvos at the ruling dispensation, even saying that the Narendra Modi led NDA government is "a fascist regime" practising an undeclared dictatorship. NEW DELHI: Acclaimed writer Nayantara Sahgal was presented a Lifetime Achievement Award at a literature festival here. A member of the Nehru-Gandhi family and a constant face in the protest against the alleged intolerance in the country, she fired a series of salvos at the ruling dispensation, even saying that the Narendra Modi led NDA government is "a fascist regime" practising an undeclared dictatorship. It is the duty of any leadership to bring the best out of its people. But the present leadership has made sure to bring the worst out of its people. They are deliberately taking no action against the mob," Sahgal said on the opening day of the Times Lit Fest. The writer of the immensely popular novel "Rich Like Us," which won the Sahitya Akademi Award in 1986, further added that for thousands of years, the Indian civilization has stood for dissent and argument. "I would like to point out that dissent is no longer the right word. It is not intolerance to threaten and kill those you disagree with. It is murder. We rejected a religious identity at the time of independence despite being very religious people. We chose to be secular because every religion could have its pride of place in India. I am afraid it is no longer so. "We are under an undeclared dictatorship. Because people who disagree with the ideology of the establishment are threatened and murdered. There is a huge population out there living in constant fear. They are Muslims and Dalits. I want you to remember that we are living in times when Indians are killing Indians. And since they have ordered us not to speak, we are ensuring that we speak out loud at every chance that we get," Sahgal added. In the context of the ongoing controversy around Sanjay Leela Bhansali's film "Padmavati," whose release has been postponed in view of the raging protests, Sahgal said that it would be "the defeat for Indian democracy" if the movie wasn't allowed to release. "I don't think banning of books or movies should have a place in our society. If we were worried about hurting people's sentiments then we would still be burning widows. Sati would have never been abolished if we cared for what the sentiments of people were. If a sentiment is wrong then it must be hurt. "Art and literature are not bound by sentiments. We have 1.5 billion people and we have that many sentiments," she maintained. She went on to remind the audience here that when Salman Rushdie's "The Satanic Verses" was being banned, she wrote to then Prime Minsiter Rajiv Gandhi, urging him not to ban the book. But ultimately her advise was not taken and the book was banned. She also recalled that she wrote a letter to the Sahitya Akademi during the emergency imposed by former Prime Minsiter Indira Gandhi, asking it to condemn censorship. "But the Akademi was too scared to act and so I resigned from the Advisory committee. It wasn't the first time in 2015 when I had said or done something against the establishment," she said. Sahgal, along with a host of other reputed authors had returned their awards in late 2015 in protest against what they called "a climate of growing intolerance" in the country. She also maintained that not all political parties in India are anti-democratic in principle. In fact, she said, apart from the "ruling dispensation", all other political parties are democratic in their belief although all of them may have their own shortcomings. "Indira Gandhi was a democrat gone wrong. The present dispensation is a fascist regime. Do not forget that even (Adolf) Hitler was elected by the people. Her session was briefly interrupted by a handful of individuals who demanded she respond to killings by cow vigilanties. Bollywood actress Shabana Azmi and novelist Kiran Nagarkar were seen expressing their anger at the hecklers. 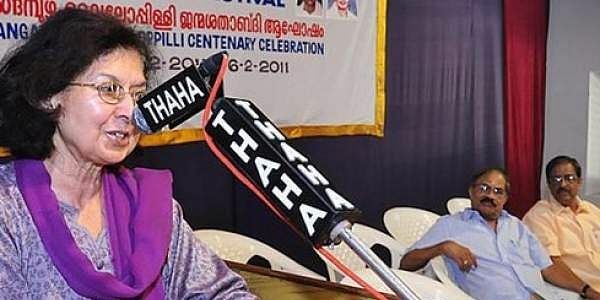 Sahgal, whose latest book is "When The Moon Shines By Day" further claimed that the electronic media has been compromised or has, in her own words, at least lost its track. "But I am glad that there are the bastions of news in print and that is why I read them with great attention and admiration," she concluded. The leading literary author earlier expressed her gratitude on being presented with the Lifetime Achievement Award, saying that she wondered all her life whether people read her, listened to her or no. "Such moments assure you that your work has been taken seriously and read by a lot of people," she said. She was presented with the Lifetime Achievement Award for "the rich corpus of work that marks her life" and for "serving as a constant reminder for what the duties of a writer are".